FileMaker started life on the Mac and the company is still a subsidiary of Apple. For all that, the PC version of the product is a mature and well featured database, fully adjusted to the PC way of doing things. Version 8 saw the introduction of email merge, tabbed layouts and export to Excel and PDF, and this new release feels like v8 with an add-on. The documentation supports this - there are two manuals for 8.0 and a thin supplement covering the new bits of 8.5. Even though this product is suffixed with Pro and Advanced, it's still built around the card file paradigm that's made it supremely easy to use. In fact, if one of the many templates provided fits your application, you can fill in fields almost as soon as you've installed. The key (and almost only) new feature of v8.5 is its ability to add a web page viewer to a database record. There are several ways it can be useful, but perhaps the most obvious are displaying map, financial or delivery tracking information. If you have set up a customer contacts list in FileMaker, you can now call on Google Maps or MapQuest to display a map of each customer, based on the contents of their address field when you display their record. With a share portfolio database, you could call up FTSE news on each company you've invested in. With a customer order database, you can call up Fed Ex tracking for any order and view the current status of the delivery. 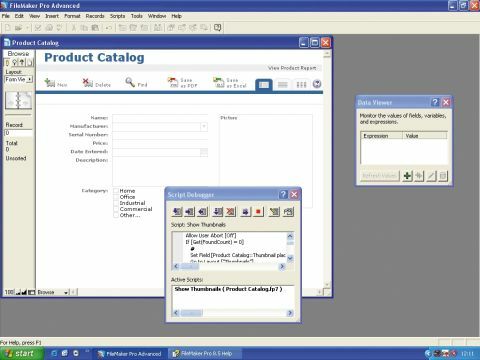 There are many more websites that could offer useful extra information on items in a FileMaker database and only a couple of clicks are needed to incorporate the feature into a database design. There's more that could be done with this feature; the way it's currently implemented means it's hard to extract individual data from a displayed page, other than to export or print the whole thing. However, a developer can write scripts to take text from a web page field to a FileMaker field. FileMaker makes use of underlying code in whatever Internet browser you have on your PC and places the resulting web page into a frame on the active record. The Advanced version of FileMaker Pro 8.5 is a good bit more expensive than the straight product. Its additions are nearly all for the database developer, with features like custom menus, write-your-own tooltips and a script debugger. Sound familiar? Yes, these 'extras' are already available in FileMaker Pro 8.0 Advanced, so if you have that, there's not a lot new for you here. The main extension of the Advanced version over the Pro product is its ability to create runtime applications, which you can deploy across an office. Although you only get a single licence for development, the databases you create as runtime applications can be freely distributed. Scripts govern the capabilities of FileMaker databases, and to help with development, the script debugger now includes a series of tools to help correct problems. You can step through a script line-by-line, for example, and watch the changes in real time. You can monitor fields, variables and calculations to see if and when inconsistencies arise and you can disable script steps to temporarily remove suspect sections. All objects in a FileMaker layout now have to be named, which is a bit tedious, but brings benefits if you make use of the script step (Go to Object). You can now interrogate an object to discover its size, orientation and content and whether it's the active object. Hard to believe you couldn't do this before. The more you think about the main new feature of FileMaker in version 8.5, the more applications suggest themselves. Although there are some shortcomings on the level of interactivity with displayed web data, even as read-only information it has many uses.